CANNES, France—Creative agency Joan launched in New York this year with a very specific goal: providing clients with a more flexible approach to marketing by surrounding principals Jaime Robinson and Lisa Clunie with a rotating cast of creative and production staffers so they can nimbly serve each client in an increasingly project-based marketplace. General Mills is the shop's first account. Joan is also relatively unique as an agency led by two women, and its mission statement notes that its name was "inspired by all of the Joans throughout history who have brought big changes to the world." 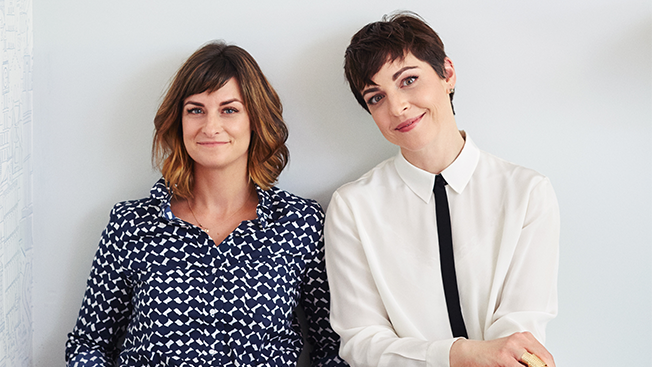 Adweek spoke to Robinson (Wieden + Kennedy, Pereira & O'Dell) and Clunie (Refinery29, Ogilvy & Mather) at the Cannes Festival of Creativity to discuss their approach to the agency model and the current state of advertising to both men and women. Do you think agencies view work targeted to women differently than work targeted to men? Jaime Robinson: In the creative industry, we all bring our personal experiences to the table—that's where all of our creative juice comes from. But I don't think enough energy is being put into work for women. It's sad, because when a brief comes in for a women's brand to an agency, most of the creatives run. As someone who's run two creative departments at great agencies, [I can say that] it's harder to get people to work on a women's brand than a men's brand. Oftentimes, there's a fear that it won't amount to good work because the tendency is to be more conservative. Watch any daytime TV program: It's either wallpaper for pretty people or it's wallpaper for cleaning people. Does Joan see itself as a female-focused agency? Robinson: Only 20 [percent] to 25 percent of our work is targeted toward women, while 75 percent is general market. But we are excited about the opportunity to make this sort of work better. Our thought is, let's bring in the most diverse group of creative minds we can find and target it to whatever audience. What do you think of the Association of National Advertisers' recent #SeeHer push for more accurate portrayals of women in ads? Robinson: That is important, but if you really want to "see her," you should acknowledge that she has a brain. When you create work that acknowledges that she can laugh and you care to give her the best kind of work you can give her, that's the most important thing. Lisa Clunie: A woman can tell a dirty joke as well as anyone. We're not all into yoga, dance and beaches. That's true of men, too: they're not all jock-y football types. Over the past few months, we've reported on several agencies with "rotating cast" models similar to yours, like San Francisco's Partners in Crime and Erich & Kallman. Is this a trend? Clunie: Yes. When working with so many different brands, it's difficult to pull together a static team that can play all those parts. Because I came from Refinery29 and Jaime came from W+K, we're attracting a bizarre mix of clients that include lots of packaged-goods companies, classic brands that want giant campaign ideas, and fashion brands. But if we're doing something for a luxury brand, we can't use the people from the consumer goods side very well. Clients also want more project work, and talent doesn't necessarily want to stick to [what they've worked on] before either—people would like more flexible lives. We don't have account people and planners in the traditional way: We have blurry lines. A lot of the people we're meeting are Swiss Army Knives, and that's better for us. How will you combine your histories working for traditional creative agencies and an editorial publication well known for its native advertising unit?